The transformation of this street in Barcelona’s Eixample or Expansion District into one of the world’s most luxurious avenues has been a long process not without its share of hardships. Passeig de Gracia’s worldwide fame spread in the wake of the 1992 Barcelona Summer Olympics, when the prestigious U.S. urban designer Allan B. Jacobs discussed it in his book Great Streets, setting it on a par with New York’s Fifth Avenue and Paris’s Champs-Élysées (a street in which our avenue sees itself reflected). Passeig de Gracia’s most particular feature, however, is its perfect blend of unique architectural heritage and high-end shopping, but it would be best to consider all this one step at a time because the path leading up to this avenue’s status as Barcelona’s Luxury Promenade has not always been an easy one. 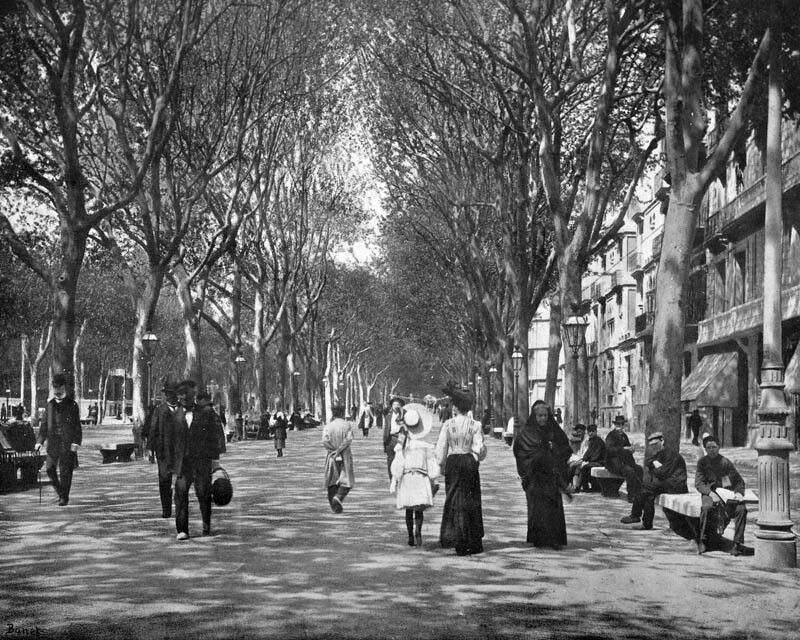 To understand how Passeig de Gracia came to be, we should travel back in time to the Barcelona of the 14th century. In 1370, King Peter the Ceremonious issued a law forbidding the construction of any more religious buildings within the medieval city’s walled precinct. Accordingly, in 1429, a new structure – the Franciscan convent called Santa Maria de Jesús– was erected more or less opposite the site where Antoni Gaudí’s Casa Batlló stands today. Between what is now a square called Portal de l’Àngel (Gate of the Angel) and the convent, the road (today’s Passeig) came to be called the Camí (Way) de Jesús, going on from there by the name of Camí de Gracia since it led to what was then the town of Gracia (now a city district), to the north. The convent remained standing until the Napoleonic invasion in 1813, when it was demolished. A few years later, during the “Liberal Triennium” of 1820-1823, in the times of King Ferdinand VII, the municipal authorities decided to fix up the road. They commissioned the military engineer Ramon Plana to do the job, although the restoration of the absolute power of the monarchy finally prevented the work from being carried out. The project would be resumed by the Field Marshal of Catalonia, Francisco Bernaldo de Quirós (Marqués of Campo Sagrado), in August of 1824. To defray the expenses of the works on the road, the king approved a tax of twenty reales de vellón on each pig slaughtered in the city. 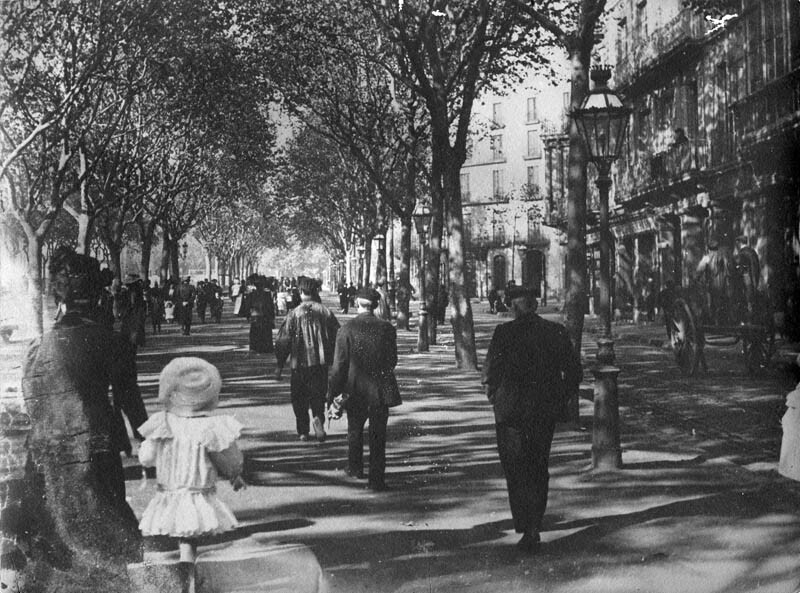 It is curious indeed to find that a glamorous avenue like Passeig de Gracia had such hardly noble beginnings. The fact is, however, that the tax proved effective and three years later (instead of five as had been envisaged) the remodelled road to the town of Gracia was inaugurated. The first gas lights would be installed here in 1852. On October 4, 1860, Ferdinand VII’s daughter, Isabella II, laid the foundation stone of the ambitious urban development scheme conceived by the engineer Ildefons Cerdà. The project, which had been approved one year earlier, was a liberation for the city of Barcelona, which had remained corseted within its medieval walls until then. Indeed, the expansion process would multiply by ten the land area available for development, which posed a real challenge for the local architects and builders and marked the starting shot for the rise of the celebrated Modernisme movement. 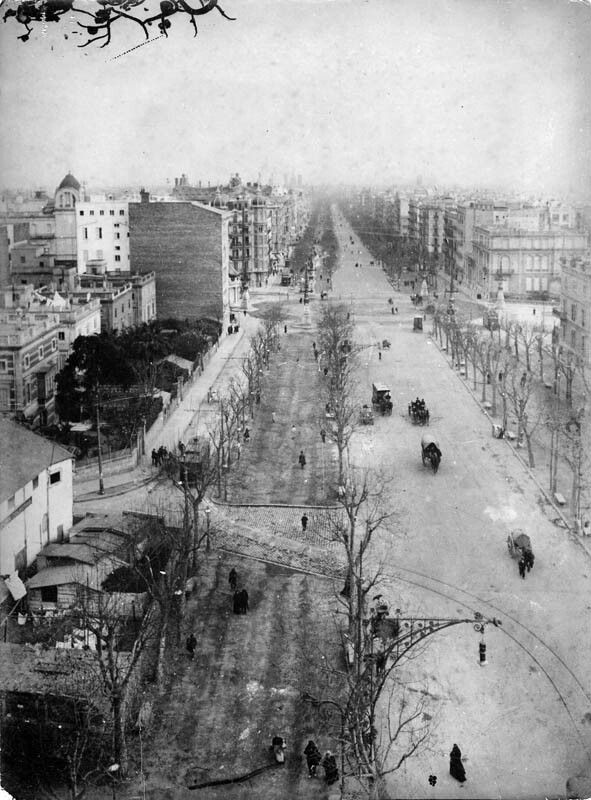 From the very beginning, the aristocracy and bourgeoisie chose Passeig de Gracia as the location for their mansions. In fact, they were already acquainted with the area because they had previously strolled and amused themselves here. Before the start-up of the Cerdà Plan, there were pleasure gardens (including Prado Catalán, Camps Elisis, Jardí de la Nimfa, Criadero, Tívoli and Español) leading off from the road, with numerous restaurants and theatres. These structures, however, were made of wood since they were under the constant threat of demolition by government order. Indeed, a military law was in force that prohibited any structure from being built outside the city within a cannon shot of its walls, that is to say, a distance of 1,250 metres. The Cerdà Plan would put an end to all these restrictions, ushering in a building fever. What was subsequently to happen is a well-known fact: the most exclusive stores progressively moved from Carrer Ferran and the Rambla to the new avenue, in the wake of their clientele. The headquarters of many big banking institutions installed themselves along the avenue in the mid 20th century, leading to a decline in the number of people along the sidewalks. When these institutions moved to other areas of the city, however, the prestige stores regained their impetus. The rediscovery of the Modernista heritage, in particular, turned Passeig de Gracia into an indispensable sight to see in Barcelona, and it began to appear on all the international tourism programmes. Today, the world’s most prestigious brands and labels rival for a place at Passeig de Gracia. Finding business premises here is no easy task because of the competition and the importance that the leading firms attribute to possessing a sales point on this Barcelona avenue. The Eixample district, where it is located, boasts the most magnificent set of Modernista buildings while Passeig de Gracia, in particular, is the site of those of greatest international fame. There is a reason for this. With the advent of Ildefons Cerdà’s development project, the most prominent families of Barcelona left the narrow Old Town behind them, moving to this new and more spacious and prestigious area. To be a person of importance at the end of the 19th century, it was necessary to stand out, not only by wearing the finest clothes and hats but also by having one’s home built by the most daring and illustrious architects. Along Passeig de Gracia, one finds buildings by Antoni Gaudí, Josep Puig i Cadafalch, Lluís Domènech i Montaner and Enric Sagnier, among others. In the beginning, however, these architectural masterpieces were not appreciated by everyone and were often said to be overelaborate and contrived. 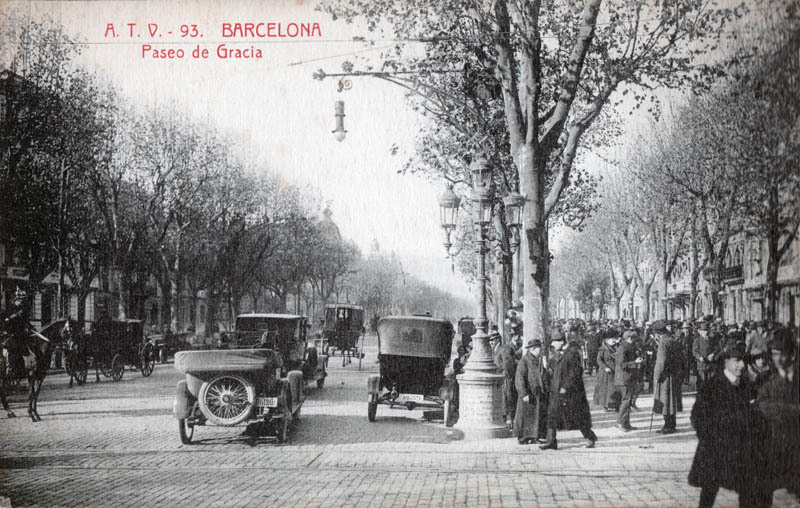 Indeed, when the famous French politician Georges Clemenceau visited our city and came to Passeig de Gracia, the sight of such a wild succession of colours and ornamentation on the façades here caused him to tell his chauffeur to turn around and take another route. Some experts on that period hold that this was actually the reason behind his hasty return to Paris. Whatever the case may be, Clemenceau was not the only one to be taken aback by this splurge of creativity. 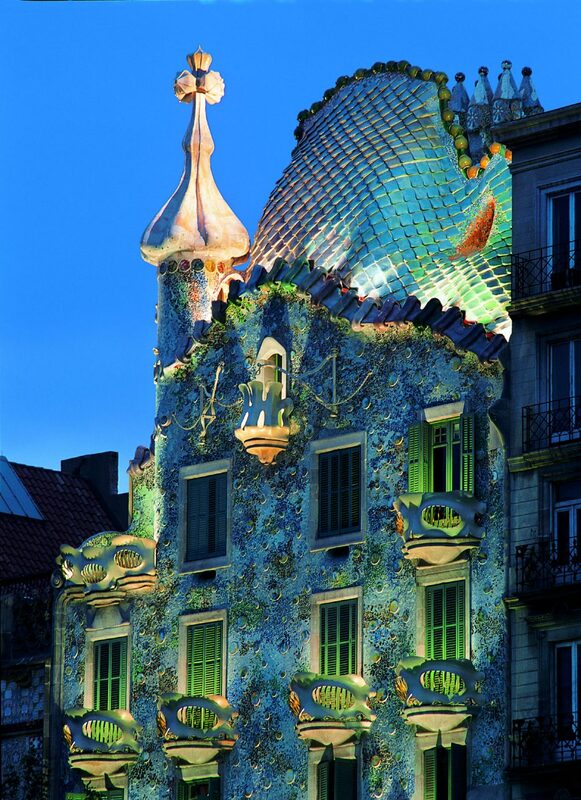 The authors Paul Morand and Evelyn Waugh, for example, on seeing Gaudí’s Casa Batlló, came to the mistaken conclusion that they were standing before the headquarters of the Turkish consulate. Modernista houses are to be seen the Manzana de la Discòrdia, a play on words in the Catalan language which means both the “Block of Discord” and the “Apple of Discord” referring to the mythological story of the Judgement of Paris since the architects sought to outdo each other in creating fanciful structures. The result may be said to be truly spectacular. 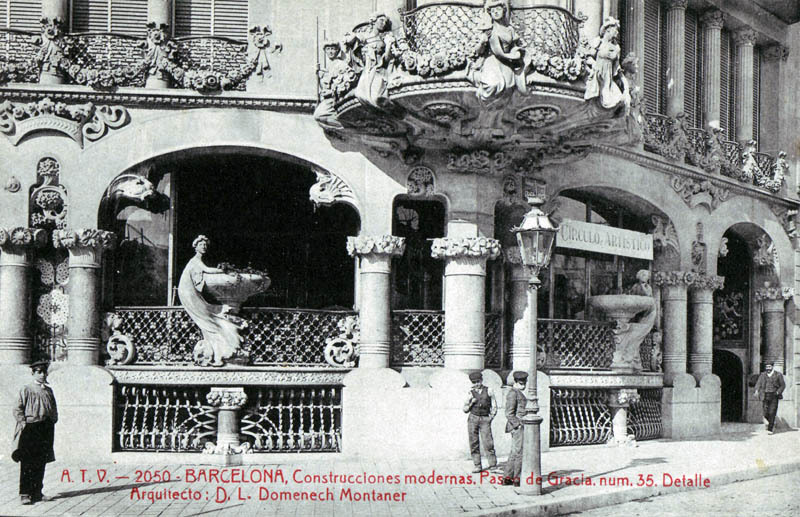 The competition began with the wealthy chocolate manufacturer and amateur photographer Antoni Amatller. He commissioned the architect Puig i Cadafalch, who began a reform of the industrialist’s home that was to transform it to such an extent that, on seeing it, one immediately thinks of the houses in the Netherlands. The textile manufacturer Josep Batlló then commissioned Gaudí to reform the building next door. The great architect’s imagination and the originality of his assistant, Josep Maria Jujol, did the rest. The façade, which is one of the most photographed worldwide, tells the story of St. George, the patron of Catalonia. If you spend some time looking at it, you can find the dragon, the spear and the rose. Such a masterful job was to have its reward: UNESCO has listed it as a World Heritage Site. 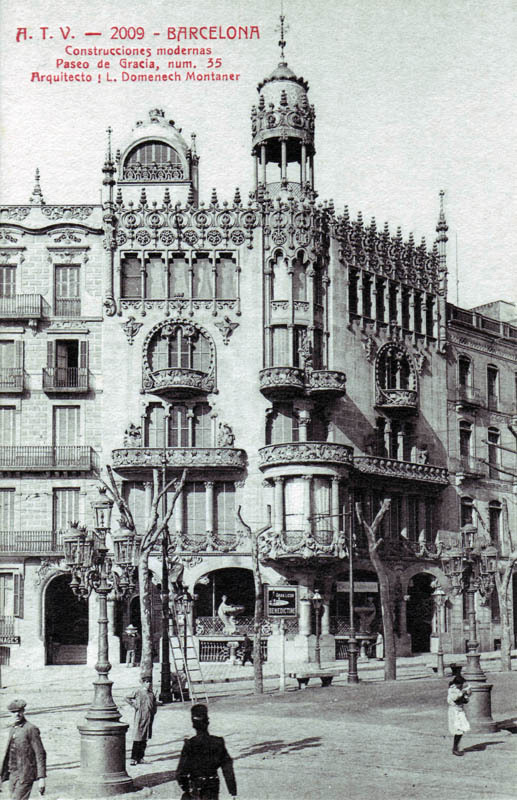 The third building in discord is the Casa Lleó Morera, by Domènech i Montaner. The damage caused to the roof pavilion in the Spanish Civil War (1936-1939) was repaired at the end of the 20th century by the prestigious architect Òscar Tusquets, in order to restore its original beauty. A little farther up the street one finds another gem by Gaudí: La Pedrera or the Casa Milà, which is also a World Heritage Site. In this structure the façade evokes the waves of the sea, while the balcony railings take the shape of seaweed. The roof terrace, for its part, never fails to surprise visitors, with its chimneys resembling helmeted medieval soldiers. This is a detail that did not go unnoticed for the movie maker George Lucas, who drew his inspiration from them on designing the Imperial Army’s uniforms in the Star Wars series. All this praise contrasts sharply with the initial criticisms. In fact, for a time the neighbours of the Milàs even snubbed them in public because they thought the value of their houses would fall by having such a monstrous mass of stone like La Pedrera nearby. The house frequently appeared in the press as well. Some satirical magazines suggested that if the inhabitants of La Pedrera wanted a pet, they would do better to get a snake rather than a dog: the great architect’s fondness for curving lines was well known to everyone. All these buildings are “musts” for tourists visiting the city. One thing that many people do not know, however, is that the pavement tiles with sea life patterns on the sidewalks of Passeig de Gracia were designed by Gaudí. The choice of these tiles is perhaps the best tribute that can be paid to the great architect. For their part, the street lights along the avenue are the work of Pere Falqués i Urpí and have been there since 1906. All this is just a sample of what you can find by looking around as you stroll along the avenue, above all if you stop from time to time to raise your eyes. It is an easy thing to do if you don’t want to miss the decorative details of the buildings, which even include a metal cupola sheltering the astronomic observatory of the association Aster. The cultural offering here is quite tempting indeed. At the Palau Robert, right next to Avinguda Diagonal, the Catalonia Tourism Department holds interesting exhibitions, and displays can also be seen on the “Noble Floor” of La Pedrera. A few steps away, you can see the city’s foremost private contemporary art collection at Fundació Suñol. Likewise, anyone who takes delight in pleasant fragrances is sure to enjoy the Perfume Museum, which is located in a magnificent perfumery, Perfumeria Regia, displaying one of the best collections of perfume bottles anywhere to be seen, with pieces ranging from the ancient Egyptian period to the present day. In short, with these and the many other attractions at your disposal, you can indulge in your cultural interests without even straying from the avenue. When the prominent bourgeois and aristocratic families moved to Passeig de Gràcia, they were followed by a throng of merchants eager to keep their best customers. Right from the start, many establishments opened branches on the avenue. 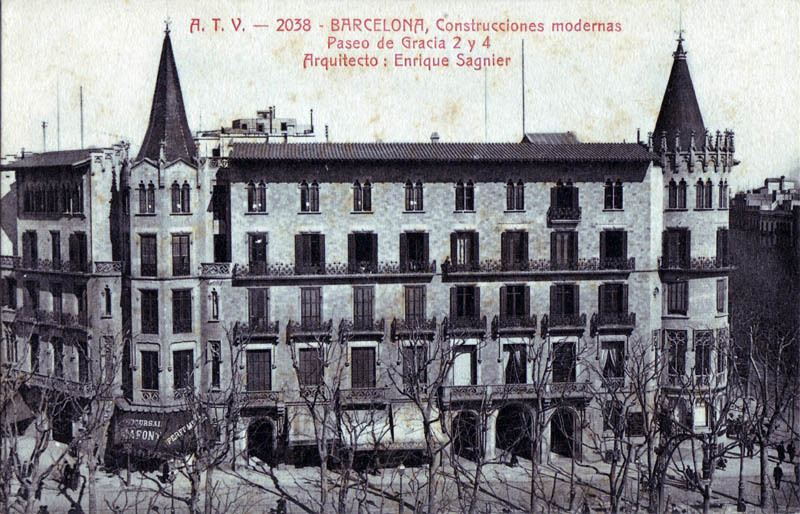 Furest (which was already a Purveyor to the Spanish Royal Household at that time) opened a location at Passeig de Gràcia in 1917, Gonzalo Comella did so in 1940 and was followed by Santa Eulalia (founded in 1843 at La Rambla and one of the pioneers in holding fashion shows) one year later. Loewe installed a branch here too (on the ground floor of the Casa Lleó Morera), as did the tailor Bel, El Dique Flotante and the jewellers Roca and Masriera. This dynamic process was cut short in the mid 1950s by the arrival of banks, film distributors (RKO, Warner Bros.) and car dealers (Cadillac, Packard), which led to a reduction in the number of people walking along the avenue, despite the proliferation of cinemas. Despite this, however, if a person wanted to have an air of importance in the Barcelona of those times, it was still necessary to be seen along Passeig de Gràcia: it was a sort of social ritual and anyone who wanted to get ahead had to comply with it. In view of all this, it is not surprising that the wealthy socialite Maria Regordosa, on preparing to leave her home at Plaça Urquinaona, would always say to her chauffeur “Let’s go to Passeig de Gràcia and let people see us”. 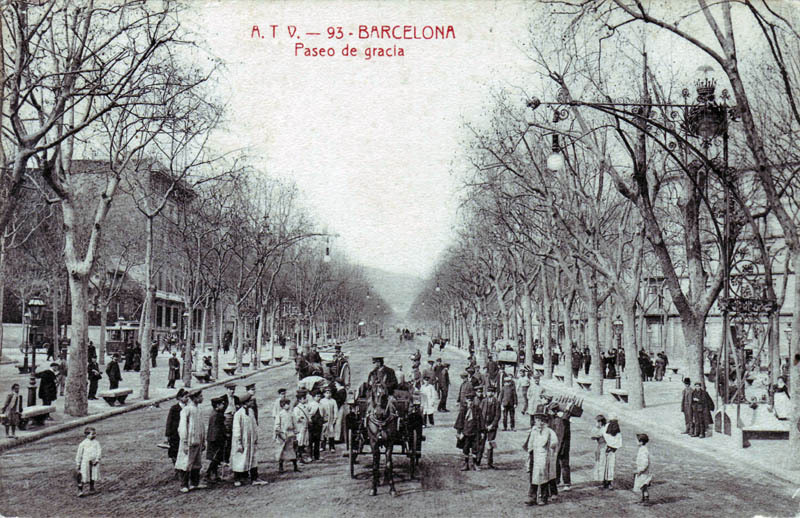 Likewise, considering all the movement along the avenue, especially on weekends, it is not surprising to find that the first traffic ticket given to a driver in Barcelona was written out precisely at this avenue. Passeig de Gràcia was also a pioneer in Spain in serving espressos and panettoni – at the former Cafeteria Milà, and in serving vermouth at the Cafè Torino, whose owner, the Italian Flaminio Mezzalama, obtained exclusive rights to this drink from Martini & Rossi. At his milk bar at the corner of Carrer Aragó, Raimon Colomer also obtained exclusive rights for what was at the time a very innovative product: yoghurt. Two establishments along Passeig de Gràcia even commissioned the great architect Antoni Gaudí to do their interior design, but unfortunately neither of them have come down to us. One was the Cafè Torino, which was just mentioned with respect to its vermouth and where Gaudí’s colleague Puig i Cadafalch also decorated one of the rooms. The other one was the Farmàcia Gibert, which stood at what is today Plaça de Catalunya, on the side now occupied by a big department store. 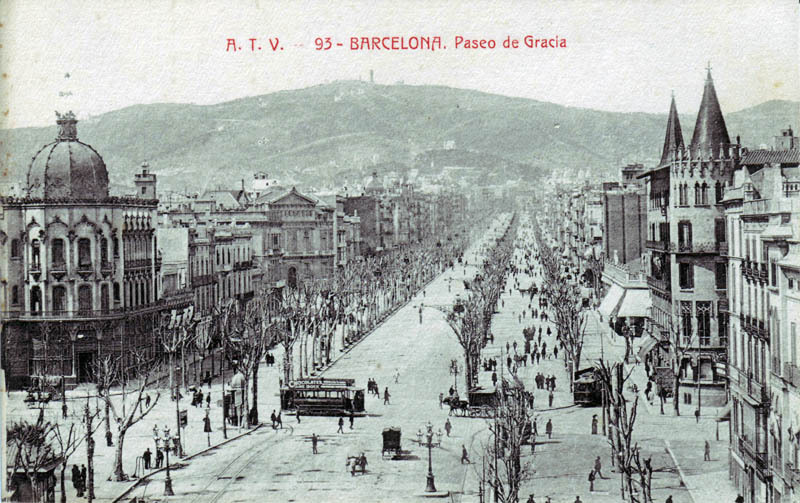 It should be understood that the street numbers of Passeig de Gràcia originally started just where the square called Portal de l´Àngel ends, since Plaça de Catalunya was only an undeveloped plot until well into the 20th century. Passeig de Gràcia is a magnificent showcase that has always stood at the service of the most demanding customers. Indeed, this service-minded spirit has never ceased to mark it and it is something that is especially appreciated by discerning fashion lovers. Together with the many select establishments which have their origins in our country, a large number of top international labels – some of which waited years to find just the right premises for their distinguished clientele– are to be found here. The list of international firms that have already opened stores at the Luxury Promenade is quite impressive: Cartier, Tiffany´s, Chanel, YSL, Dolce & Gabbana, Valentino, Prada and Stella McCartney, just to name a few. In fact, there are over 160 establishments along the avenue. A little over half, 65% to be exact, are exclusive Spanish firms while the rest are well-known international stores. A surprising fact is that one of every four purchases made in Spain by visitors from outside the European Union are made right here, at Passeig de Gràcia. The big hotels, for their part, are also located on the avenue: Majestic, Mandarin Oriental, Omm, Casa Fuster and Comtes de Barcelona are a few examples. Most of them have absolutely spectacular roof terraces in addition to superb restaurants boasting Michelin stars.